The traditional quiet start to a new year for hedgehog rescues has not been evident so far. Spring like temperatures over the past months have meant hedgehogs are still out and about - one even being admitted on Christmas Day! The annual deep cleaning of the hedgehog hospital has been difficult with so many hogs still in residence. The sunshine has encouraged keen gardeners to make an early start in the garden. We cannot emphasise enough the need to check carefully, and thoroughly, before strimming or clearing overgrown areas with spades and forks. Every year sees hedgehogs admitted with appalling strimmer injuries or legs broken, and even severed, by spades. Many have to be euthanized; the “lucky’ ones are often left permanently disabled. It’s surely worth the time to gently probe with a cane or, if the area is small enough, kneel down and check with your hands? A supply of food is also a necessity at this time of year when natural food is still very much in short supply. The hedgehog loses about a third of its body weight during hibernation so when the unseasonal high temperatures rouse them from hibernation, albeit briefly, they need to be able to replenish this weight loss. A feeding station is a very good idea at this time of year especially to offer protection from the elements (see our website www.snuffles-rescue.com to buy or make your own). And a water bowl placed inside rather than outside the feeding station often prevents the water from freezing. There has been much publicity about feeding mealworms recently. Research has shown that mealworms are not nutritional and, in quantity, are detrimental to the bone density of the hog. A case of ‘nice but naughty’! Hedgehogs love them and it’s been a traditional addition to their food for many years. But now we advise that you either stop using them altogether or occasionally sprinkle the tiniest pinch on other, more nutritious, food. We have heard of whole bowlfuls of mealworms being out and nothing else. The hedgehogs can become addicted and we’ve had some ‘junkies’ that refused all other food and had to be weaned off the mealworms. So it’s actually a disservice to encourage them to eat only one kind of food when natural, nutritious, food becomes available. There is a fascinating video of a tracked hedgehog moving around an urban housing estate. Using 10-15 gardens to forage for food the hog also makes overnight stops in 5 or 6 different areas. (Please use the ‘Contact Us’ page on our website to ask for the link). Early March brought very strong winds. 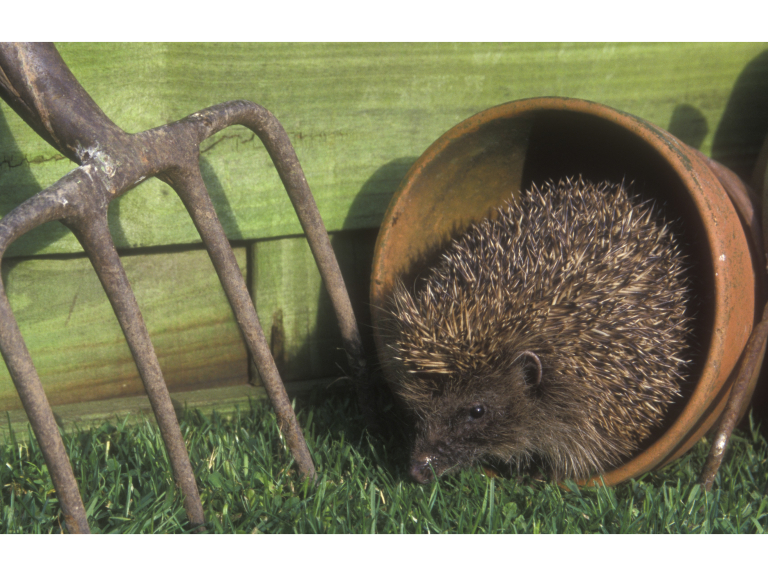 If your fencing has blown down, consider replacing it with fencing that has hedgehog friendly gaps in the base. Or take the opportunity to check that a tunnel under the gravel board base won’t harm your neighbour’s planting and ask their agreement to create a hedgehog highway. Hedgehogs need all the space they can get.